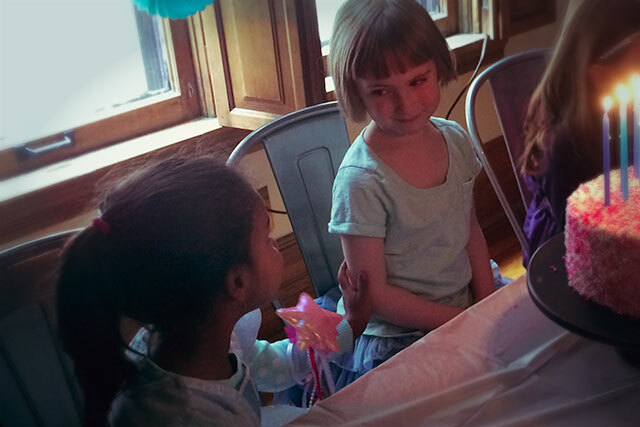 We had a dozen five-year-olds in the house, and the party was fast and fun. I snapped most of these photos after they had left, but before our family came by. Hey look, a sneak preview of the books on the shelves! 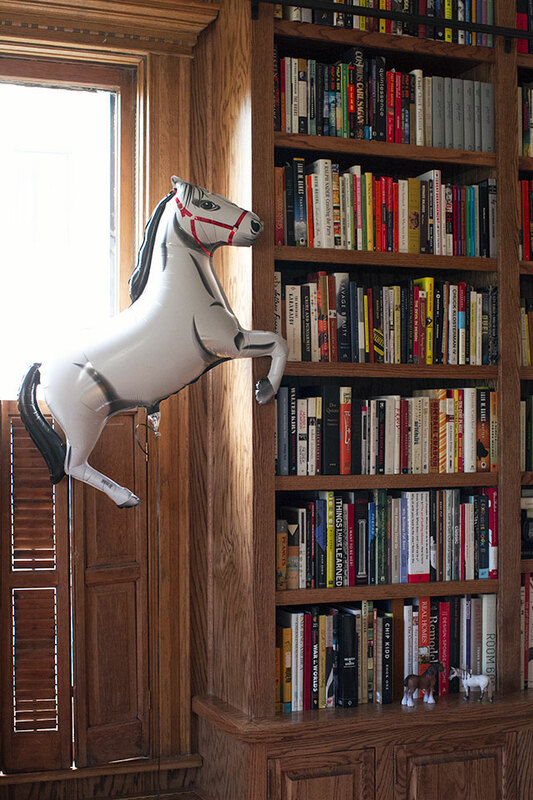 With a weird, giant horse balloon. That photo of E from when she was six months old still cracks me up! The kids at the party spent most of their time up in the playroom, playing with Play Doh, using the toy kitchen, and trying on dress-up clothes. We didn’t want to interrupt them and steer them toward activities (like Pin the Tail on the Pony) that they might not really enjoy when they were already having fun, so we went with the play that was happening naturally. At one point, Eleanor and some of the other kids formed a marching band and they went through the house making a jolly racket, and my favorite getup was the girl who paired leopard-print kitty ears with black glasses and bongos. I like your style, young lady. We put down a plastic tablecloth and rounded all the kids up when the pizzas we ordered had arrived. To keep them busy in their seats while we got the food ready, we had markers and pre-cut circles of paper that fit my button making machine. The kids ate while Brandon made their designs into magnets, which they took home at the end of the party along with their goody bags. After pizza came the birthday cake. I didn’t get a great shot of it because Brandon and I were both busy keeping up with all of the kids, but the cake looked similar to the one in my post on horse birthday party inspiration. 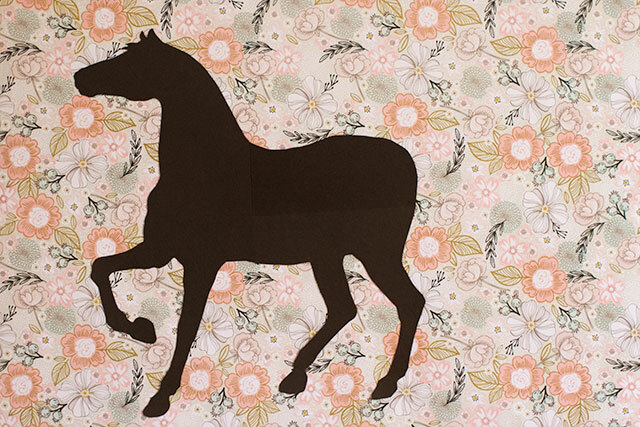 Instead of bunting, I made some big paper hearts to go behind a toy horse. But oh! The look on Eleanor’s face, and her friend’s hand on her arm. Love this shot. And thus went our birthday celebration weekend. I don’t know if we’ll divide the parties up the same way next time though — we were all exhausted! I’m curious… do you combine the kids and the family into one party? Have them on separate days? Just do one or the other? We might need to rethink our approach. For my whole life we alternated having a friend party one year, and a family party the next year and it worked out quite well for everyone involved (for sure for my Mom). My daughter’s birthday is right before Christmas, and even with all that activity we decided to do two parties this year. My house is small, and it’s typically raining at that time of the year, so having all the family plus kids and their parents got a little tight! 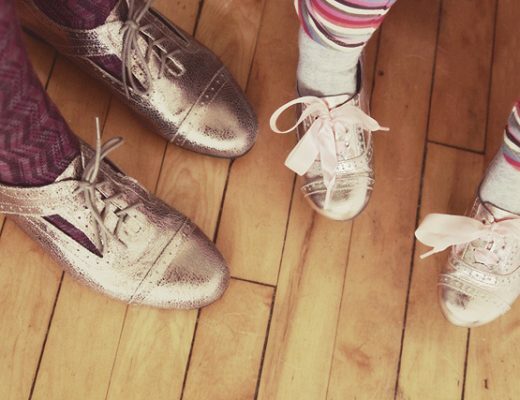 I did break it up, however – kids on Saturday, and family on Sunday. We have family far away, so we don’t usually run into that problem. We had my Eleanor’s third birthday this weekend and were so tuckered out after 7 little girls that we hit the train restaurant for dinner. And Brown cow. 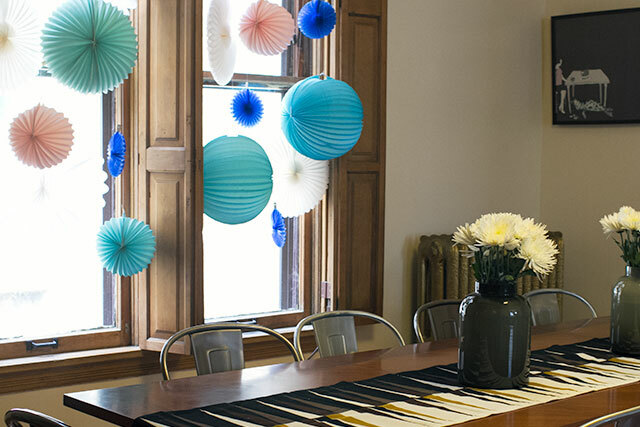 We love the birthday party as a fancy playdate plan. We let family host the family party… it’s at grandma’s. I help out by bringing food or whatever but really, it’s just about getting the family together so it’s pretty low key in terms of planning and organization. Because the location is different, it’s usually on a different day. Often a different weekend, and often combined with some other (adult family member) birthday. Do you only have family on one side? Or one grandma that is happy to host over the other? We combine friends and family if the kids are having a friend party. It seems every year we throw a blow out party for the kids, all we can handle the next year is a small family dinner. That also has worked out (weirdly) to mean they have big parties on odd numbered birthdays (1,3,5) and nothing happens on evens… may be because we’ve had a kid every year for the past four. Hmmm. OMG I have three kids. Not four. Unclear comment and sad math skills. I ordered them from Amazon. They were much nicer and larger than I thought they would be! As an adult, I would totally love most of those activities the kids did. I’d be on board and consider it a fun party. What do you put in your goodie bags? I have come to LOATHE goodie bags yet feel guilty not offering them. My son’s 5th birthday party is on Saturday and instead of bags I got each kid a rainbow helicopter beanie. But I’m worried someone will still expect more. I just got tired of leaving a party with a worn-out kid, sugar he doesn’t need, and an array of pencils, stickers and dollar store crap that I throw straight into the trash. Nothing groundbreaking in ours. A squishy horse and a regular little toy horse, some stickers, and lollipops. Plus the magnets they made. Eleanor did go to a friend’s cupcake party though, and instead of goody bags, each guest got a white apron with their name embroidered on it to wear during the party and then take home. Such a great idea, and we have it hanging by the play kitchen! We just went to a party with the same favors! Mom is a seamstress, so she made the girls all their own aprons. Olivia’s is in the play kitchen too. My daughters birthday is right before Thanksgiving so we did a Thanksgiving craft which was $1 a Target. The parents loved it. 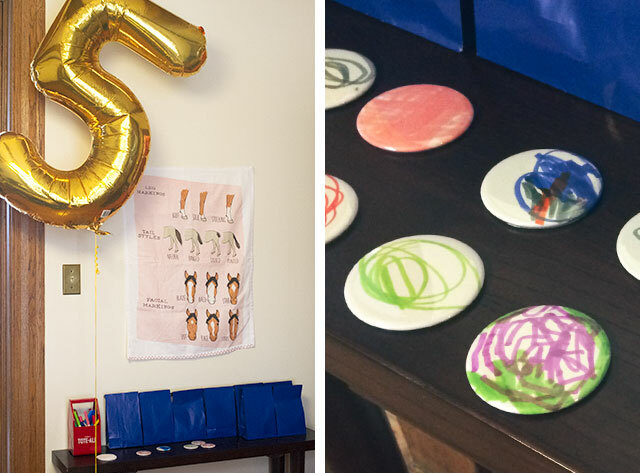 We had(have) three kids so big birthday parties were held in rotation… Each child had a big party every three years. And of course there were exceptions for the golden birthday and sweet 16 etc. 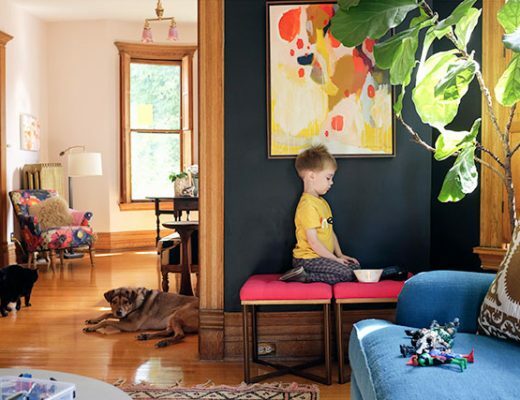 On the off years the kids could invite one or twokids for dinner or a sleep over on their birthday or there were special dinners out. My kids are 4 and 19 months. so far, we’ve just have one big party and invite family and friends. Most of our family members have kids around the same ages as our kids anyway. When they get older, we will probably pare down to just a friend activity for their birthday and not have an actual party. This looks like such a lovely party! Most of our family is far away, so we don’t usually have folks in town. We do, however, have non-kid friends that we enjoy any excuse to get together with. We’ve tried a few different set-ups, and I was fairly happy with our most recent party attempt: for my son’s 4th birthday we hosted a 2 hr kid party between lunchtime and dinner outside of our house, and then had our close friends come over to our place later for a laid-back dinner of pizza and hanging out. The party place did all the work for the kid event, and we got to enjoy not having to do much cleaning or set-up for our low-key evening. We were still tired at the end of it, but things seemed to balance out well. 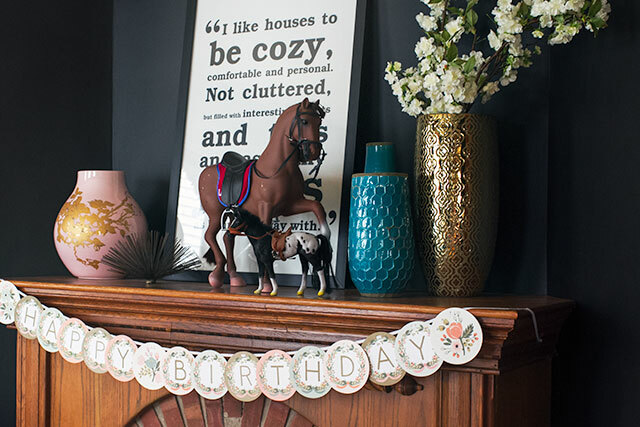 Love the horse party! 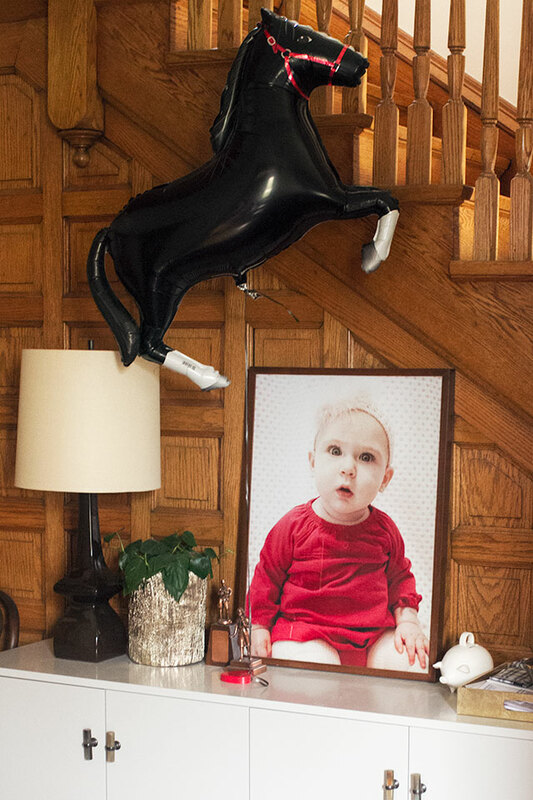 What I would have done with giant horse balloons as a child I don’t know, but I would have loved every second. When I was a kid, my mom’s side of the family would have monthly group birthdays. If a month had too many people, we would have 2 parties a few weeks apart. Every few years I would have a friends party (I think my mom forgot haha). My dad has a pretty small extended family so we didn’t do a big party with them, just a little dinner with our immediate family. It sounds like what you guys do works well! We did joint till 3 years old. Then separated friends and family on separate days. I adore her facial expression! Such personality, that girl. I don’t have kids, but my best friend has three. She usually does family dinner (and say, a cupcake), day of, and then does the kids party, the following weekend. That way the celebrations are spaced out enough for everyone to relax, enjoy, and doesn’t cause her too much stress all at once. Once my kids got old enough to want a friend birthday, we decided to just have one party with friends only. My mom takes the kids out for a special lunch around their birthday, and my husband’s mom does a family birthday dinner several times a year and kinda just clumps several birthdays in one that way. I just invite everyone to one big kid party. Our families live 6 hours away so sometimes a few come to visit but not always. Dad’s birthday is the same week but we pretty much downplay the hub’s bday and focus on the kid party. He doesn’t mind and it’s easier for my obsessive party planning affliction. Usually, we have two parties. So: Olivia’s birthday is in August, and is the only August birthday. She will have her “friend party” on the Saturday after her birthday, because she wants to have it at the ballet studio (yes, she has already planned the whole thing). Then, most likely on her actual birthday, we have a family party. Usually we let her pick a restaurant she wants to go to, or we have a family party at my grandma’s house. Both my family and Mike’s get along good, so if we do this, both families get together for it. However, March, for example, is a big birthday month with Stella (the new baby), my grandma, my cousin, and me. We usually have a big family dinner, like above, where we celebrate all of our birthdays together, and then have a smaller party for Stella separately (because she’s the kid, lol). Very nice party. I love these photos, especially the last one and second one. I like family parties when they are little and then friend parties when they are in school and have friends. We do three (3) separate parties – one for our preschooler’s friends, one for my family (my brother and his family, as my parents live 1,200km away), and one for my husband’s family (my MIL, my BIL and his family). For the first birthday party, we had one party that included everyone one. It was crazy – my MIL did not help (even when I had my little one crying in my arms while I tried to cut cake and hand it out – thankfully a friend’s husband stepped in and helped) and my BIL would grab my little one to come back and play with him (a 42 yr old man). Every time my little one crawl to his friends, my BIL pulled him back. When my brother held our little one for a few minutes, my BIL was standing right there. After that party and speaking to others, we’ve had separate parties ever since. It might feel like we are eating cake for weeks (because we are! ), but it has been sanity saving. Since my birthday is 5-days after my little one, we use the separate family parties as a birthday party to celebrate our little one and me (with the emphasis on our little one). Last year we got smart and only had cupcakes for the family parties (or leftover cake, depending on where the friends party falls amongst the family parties). This does take place over 2-3 weekends, which can be tiring… but it’s so much better mentally! My oldest son turned five right before Christmas, and we had his party at a local gymnastics place. The kids could play in the gym and they set up a bounce house for us with activities led by the staff. It was actually our first party inviting several friends over, since December is a crazy month for us and includes my son’s birthday, my husband’s birthday, and my dad’s, all in a row. Just curious, did the friends’ parents stay? At what age do people start dropping off their children at parties now? I threw my son’s 10th ice cream birthday party at our house and invited both family and friends (we usually just do cake at a park to keep the fuss down) and I think it went pretty well. My grandma (his great-grandma) got a kick out of watching all the children aged 11 to 1 play. 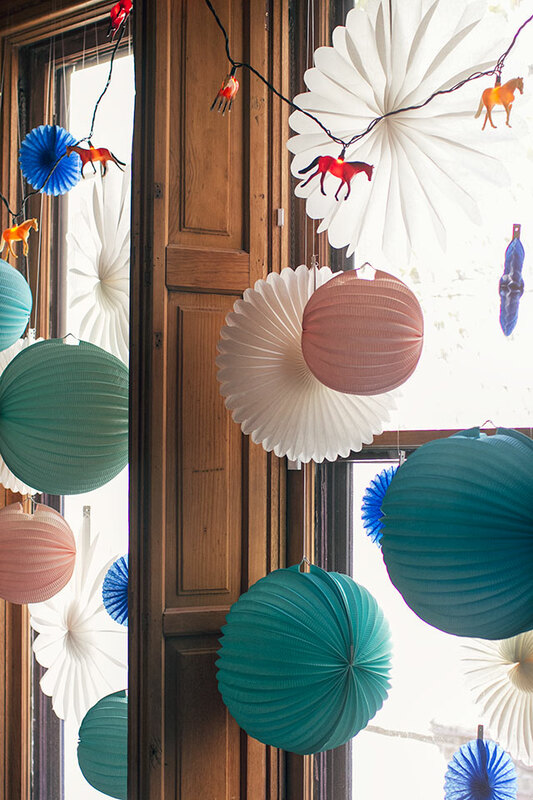 I’m loving those paper lanterns, please share where you got them! Happy birthday to Eleanor and Brandon! My dad and I have birthdays a day apart, and a cousin and I were born on the same day. When we were preschoolers (since we didn’t have friends outside of family anyway), we had joint parties hosted at my grandma’s (big house with an open layout, perfect for parties). It was always full between family and friends of the adults plus their kids and it was treated more like a family party than a birthday thing, so not a lot of organized activities. The kids always got treats and party hats, etc, but my favorite thing was that the three of us (dad, cousin, and I) had individual cakes, so even if it was a big gathering, it still felt special to each of us. It also made for great pictures, with two toddlers and my dad blowing out our candles and all. What happened to getting emails? This seems to be happening all the time now. Is this an option no longer available? The Feedburner subscription service seems to be on the fritz. This happened a couple of weeks ago and I thought the problem was resolved, but I’ll likely be moving subscriptions to something more reliable. Where did you get the cake? Or did you make it? Very pretty. I never had family close by, but my husband and second son have a birthday on the same day (was also my due date lol.) We would have a kid party and then go to dinner at the weekend for my hub. My two youngest are 2 years and 2 days apart. We had a joint party for them for years…until the memorable fist fight that broke out over who was going to blow out the candles on the cake. Helpfully videotaped by a parent at the party, and watched with horror by all the girls. Ahhh, life with boys. Can you share where you got those hanging orb thingies? I’ve come across similar things that don’t look as nice or have garish colors. Yours look lovely!